It's no secret that I cling on to summer's end with my finger tips. You won't hear talk of wooly sweaters or 'crisp leaves' or pumpkin anything (don't even get me started on pumpkin flavored coffee drinks) from me until September 23rd. Period. My deep rooted love for the sunshine season, however, doesn't mean that I don't appreciate fall colors - even before fall officially begins. As much as I adore summertime's cheery shades (I'll love you forever, yellow), I do have a fondness for autumn's more muted tones as well. And this year, I've especially got my eye on earthy greens like Pantone's Cypress (one of their official colors for this season). This gorgeous shade of dusty green is simultaneously rich and subtle, and looks great on so many different skin tones. 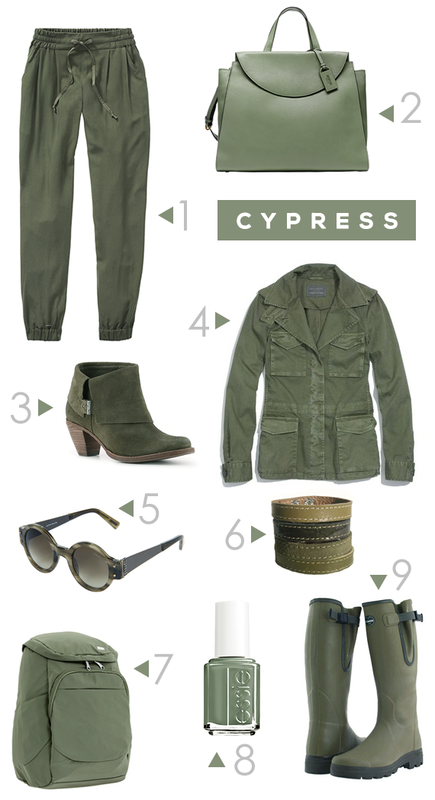 So for this edition of Color Love, I'm sharing some of my favorite Cypress-shaded items that I've come across lately. What are your thoughts on Cypress for fall? What is your favorite autumn color? Cypress is a great color, and aptly named! Love those pants -- they look sooo comfortable! love the jacket and booties. this is a great color that would work well even beyond fall i think. cold weather is not my favorite but fall fashion is a nice change. This is a fantastic fall color! I'm loving the jacket and pants! The pants in particular seem soo comfy. Yes! Very similar to sage. Just a little darker. I love sage too. What a gorgeous roundup! Those Lavin sunnies are to die for. I love seeing earthier tones for this fall instead of just the usual warm colors. This is my favorite color, fall or otherwise! Great picks! It's funny how informed we are by our parents colour choices and style. My mom's wardrobe always gravitated towards jewel tones, so earthy shades like beige, brown, rust and cypress almost never cross my mind even as options that can be worn. But seeing this post, I'm really wondering why on earth I don't own that pretty green polish from Essie - it's the perfect not-quite-neutral shade for fal! This is actually one of my favourite "neutral" colours. My parka is this colour :) I like that it goes well with so many other colours! Can I have the jacket and the bag? And the polish and the pants? Actually, I think I'll have them all! Hilariously, I'm wearing a cypress-colored vest today! I love how it goes with everything. Like Mary said, it's pretty timeless.